Now that I've converted to an iPhone, I find myself testing out travel apps left and right. Before leaving Florida for Iceland, I was contacted by Diego, CEO of WeHostels, about giving their app a test run. WeHostels is trying to make hostel booking a more social experience. They do this by choosing five of the top hostels in a major city, and then sharing information about users who book a night in them. This personal information can either be filled out within the app, or pulled from Facebook if the user approves such a connection. This allows potential guests to see photos of who has booked the hostel before they themselves make a decision. Speaking for the guys who might use this app, it's safe to say they'll be looking for which hostels have the most attractive girls. As for the girls looking for a hostel, I wouldn't be surprised if they are thinking the same thing. Seeing as how I'll be staying in hostels for the next few months, I was curious to see what the WeHostels app had to offer my experience as a perpetual traveler. Then, I downloaded the free WeHostels app from iTunes. My first impression of the app was it looked professionally designed, and operated as quickly and easily as you see in the video. While Reykjavik wasn't on the list (yet), my next stop would be Barcelona, giving me a chance to use the app to book my hostel. Clicking on the Barcelona icon brought up the top five hostels for that city. Each hostel is presented with a nice photo, and in the lower left corner, the minimum cost for a bed. Along the right side of the photo are a one to three headshots of other users booked at that hostel. One of the things I appreciate about the WeHostels approach is that they are curating hostels, instead of overwhelming users with a list of all the potential hostels in the city. 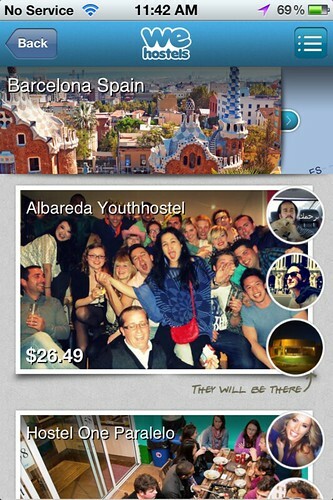 This is important if the app is going to take off, because it condenses the users into a small selection of hostels. While I see this as necessary in the beginning, since the app is new and needs to build its user base, I can also see it as a drawback since it limits one's choices. Users will have to take a leap of faith that the hostels offered really are among the best the city has to offer. 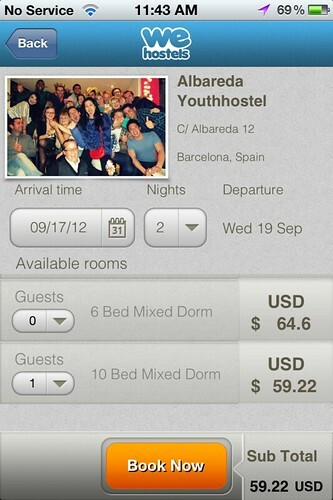 As I clicked on the different Barcelona hostels, I could better see the people who were booked at each. There's also a chat function that lets users talk and presumably, get to know each other before they arrive. User reviews of the hostels are one thing I found missing from the app. Nowadays, I almost never book a hostel in advance without reading a few reviews to get an honest feel for the place. If I see “bedbugs” mentioned, I immediately look elsewhere. Again, that goes back to trusting the options presented in the app, versus doing the research yourself. Ultimately, I chose the Albareda Youth Hostel based on its central location, availability, and price for a 10-bed dorm. The booking screens are easy to use, and require the bare minimum information for the transaction to be processed. Both Visa and Mastercard are accepted for payments. To make it even easier, I'd like to see PayPal as an option in the future. After paying, I received an email with all my booking info, and directions to the hostel, which I used upon arrival at the Barcelona airport. When I reached the hostel, I was warmly greeted by the owner at reception. Backpackers were talking and playing games in the living room. The hostel was clean, the Wi-Fi was strong, and I met a lot of friendly, young travelers during my two night stay. For example, the second night, the owner proposed we cook a communal dinner, and it felt like everyone in the hostel got involved, either buying groceries, chopping veggies, or later, washing dishes. And to feed about 20 people, it only cost each person a single Euro! Though I didn't connect with any travelers in advance, the hostel atmosphere was very social. 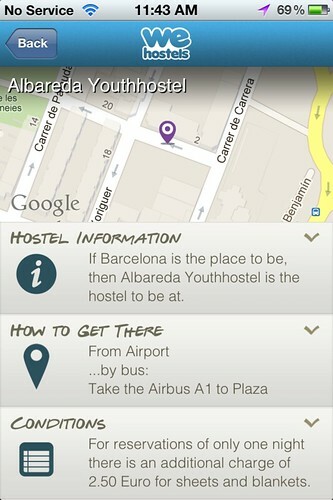 Overall, I had a very positive experience using the WeHostels app to find and book my Barcelona accommodation. Click here to download the free app for yourself from iTunes. Or to learn more about WeHostels, visit their website. Disclaimer: This is a sponsored review written by Dave. When I was in Singapore for 10 days I decided I would never go anhwreye that foreign again for longer than a week without a kitchen. Its so nice to make your own homey comfort food. for me that’s pasta : ) and definitely with jon stewart.